SAF Tehnika JSC - leading carrier-class point-to-point microwave radio manufacturer announces the release of Spectrum Compact, the world’s first handheld microwave spectrum analyzer. It is designed specifically for comfortable outdoor use - a must-have tool for any microwave radio engineer performing on-site work. Information on the resolution adopted at the extraordinary shareholders' meeting of JSC "SAF Tehnika" can be found here. The Management Board of JSC SAF Tehnika confirms that the business of the company is based on a long-term development and the increase of the turnover up to 100 millions LVL mentioned by CEO Normunds Bergs is an ambitious aim which characterizes the market potential of SAF Tehnika products in global market. The turnover mentioned in the interview is a long-term aim and now there is only theoretical possibility to reach it because it depends on the successful interaction of many different factors, but the Management Board of SAF Tehnika can affirm that company already does its best to increase the turnover. According to the agreement No. L-ĀTA-10-0369 (project No. ĀTA/2.3.1.1.1./10/17/021) concluded on 26th August 2010 between JSC "SAF Tehnika" and government institution "The Investment and Development Agency of Latvia" regarding the implementation of a project "Participation of JSC "SAF Tehnika" in international exhibitions", SAF exhibited at Broadband World Forum 2010 which took place in Paris, France, from 26th to 28th of October. From 26th to 28th of October, SAF Tehnika took part in one of the world's largest broadband events - Broadband World Forum 2010 held in Paris, France. The premier annual ICT industry event with 6000+ of the world's technology decision makers, 275+ global speakers, 280+ exhibition stands became a brilliant opportunity for SAF Tehnika to remind of itself as an European quality microwave data transmission product manufacturer and customer-adaptive wireless solutions developer. During exhibition, SAF representatives answered to visitor questions about the Company, the products as well as other technical issues related to each customer. Visitors were interested in Full Outdoor Radio technology as it is one of the most important SAF Tehnika's product advantages among competitors. The most interest was shown by visitors from France and Africa. Substantial and perspective contacts were gained for future cooperation. SAF booth L8 was attended by the existing and potential customers, potential partners who were looking for alternative microwave radio vendors and at least 85% new qualitative leads - CEO's, CTO's and Sales managers. During the exhibition all SAF product lines were presented in booth # L8. The visitors showed the most interest in the latest SAF products - CFIP Lumina and CFIP-108 FODU. On Friday, the 5th of November, SAF Tehnika was awarded as the company with the biggest rise in share price in Latvia in 2010 - since the beginning of the year the share price has increased by 629,17%. Furthermore, SAF Tehnika has been included in the TOP 500 of the most successful companies of Latvia in 2009 ranked in the position 345. The non-audited net sales of SAF Tehnika for the first quarter of financial year 2010/11 were 3.16 million LVL (4.49 million EUR) representing a 91% increase compared with the first quarter of the previous financial year, but 16% less than the previous reporting quarter. The net profit of for the first quarter of financial year 2010/11 was 276 thousand LVL (393 thousand EUR). The result was impacted by recording an allowance for doubtful debtors amounting to 215 thousand LVL (305 thousand EUR) based on a client's information about their liquidity problems. It is expected that the debt will be recovered by spring 2011 based on the agreed payment schedule. SAF Tehnika continues to pursue its strategy of focusing on new product development based on customer demands. The main focus will be switched to the development of next generation products as well as increasing manufacturing capacities to support higher customer demands. Although longer term outlook remains unpredictable, certain stability is visible in the near future. Attachment contains the decisions adopted at the annual shareholder's meeting of JSC "SAF Tehnika". The 8th November 2010 will be the account date on which the list of those holders of financial instruments will be fixed who will be entitled to dividends, but the 12th November 2010 will be the date when dividends will be paid. 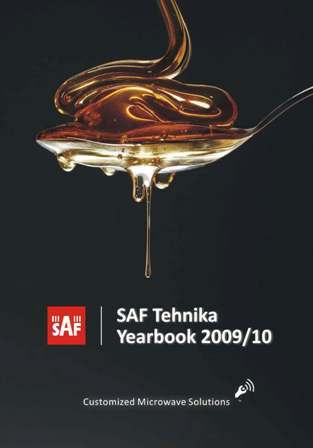 Attachment contains JSC "SAF Tehnika" yearbook 2009/2010. SAF Tehnika JSC net sales for the financial year 2009/2010 were LVL 10.23 million (EUR 14.55 million) representing a 16% increase compared with the previous financial year's net sales. Aggregate export sales for the reporting period were LVL 10.03 million (EUR 14.27 million) comprising 98.08% from total net sales. The net profit of the Company for the financial year 2009/2010 was LVL 1.487 million (EUR 2.116 million). This is an excellent result taking into account that the previous financial year was closed with LVL 1.117 million (EUR 1.589 million) loss. The result proves that the Company's strategy towards development of a new CF IP product line, expansion of direct sales, investments into product marketing, cost savings into production and operations was right and has provided SAF Tehnika a more stable position with positive perspectives. The invaluable work and loyalty of the Company's employees also has to be mentioned as a key to success. SAF Tehnika continues to pursue its established course, taking into account its stable financial position, control over the production process and CFIP product development. The Board is proposing to retain 54% of current year's profits in order to preserve the Company's financial stability and to pay out remaining 46% in dividends. Correction: information on the planned account date added. Draft resolutions of ordinary shareholder's meeting of SAF Tehnika JSC can be found in attachment. 8th November 2010 is the planned account date on which the list of those holders of financial instruments will be fixed who will be entitled to dividends. SAF Tehnika JSC net sales for the financial year 2009/2010 were LVL 10.23 million (EUR 14.55 million) representing a 16% increase compared with the previous financial year’s net sales. The net profit of the Company for the financial year 2009/2010 was LVL 1.487 million (EUR 2.116 million). This is an excellent result taking into account that the previous financial year was closed with LVL 1.117 million (EUR 1.589 million) loss. The result proves that the Company’s strategy towards development of a new CF IP product line, expansion of direct sales, investments into product marketing, cost savings into production and operations was right and has provided SAF Tehnika a more stable position with positive perspectives. The invaluable work and loyalty of the Company’s employees also has to be mentioned as a key to success. The Board is proposing to retain 54% of current year’s profits in order to preserve the Company’s financial stability and to pay out remaining 46% in dividends. Attachment contains the report on the Corporate Governance of SAF Tehnika JSC from FY 2009/2010. In June, 2009, JSC „SAF Tehnika" had started a research of the project "Development of solutions for design of new-generation wireless digital microwave radio products" co-financed by European Regional Development Fund and Latvian national budget according to the concluded agreement No.L-JPI-09-0002 (project No.JPI/2.1.2.2.1/08/01/0002) with the state agency "Investment and Development Agency of Latvia". The project is being implemented according to the project plan. Technical pre-research of duplexer- within a scope of this activity wide range of research work had been done - information analysis, programming, designing of technical solutions as well as evaluating the alternatives. The modeling of a duplexer soon will be finished and instead of analysis the synthesis mode will be applied. Testing of the evaluation of allowable errors of duplexer parameters soon will be started on the base of a real project. Using real duplexer models, it is planned to estimate the efficiency of the acquired solutions, as well as define suitability areas of the algorithm. Information on the annual shareholder's meeting of JSC "SAF Tehnika" can be found in attachment! Only english version corrected - new file attached. Information on the annual shareholders' meeting of JSC "SAF Tehnika" can be found in attachment! On 26th August 2010 JSC SAF Tehnika and government institution "The Investment and Development Agency of Latvia" concluded an agreement No. L-ĀTA-10-0369 (project No. ĀTA/2.3.1.1.1./10/17/021) regarding the implementation of a project "Participation of JSC "SAF Tehnika" in international exhibitions" co-financed by European Regional Development Fund. Project expenses estimate altogether at 99.9 thousands LVL. • CommunicAsia 2011, 21.-24.06., Singapore. Within the Project SAF Tehnika has already applied and registered to all expos except Expo Comm Italia 2011 and CommunicAsia 2011, all preparation activities for the Comptel Plus Fall 2010 have been completed and the work at NigeriaCom 2010 has been initiated. The company will participate at these exhibitions with the intention to promote SAF sales activities and international recognition of SAF Tehnika brand and products both in potential regions (US and Africa) and existing markets (Europe, CIS and Asia), as well as to publicize company image worldwide, strengthen cooperation with existing partners and attract new potential customers. Correction: changes in the Latvian version of the text. SAF Tehnika's non-audited net sales kept an upward trend. Sales for the fourth quarter of financial year 2009/10 were 3.74 million LVL (5.32 million EUR), representing an 89% increase compared with the fourth quarter of the previous financial year. This was the best quarterly sales result not only in financial year 2009/10, but the best in the last three financial years. The Company's non-audited net sales for the 12 months of financial year 2009/10 were 10.23 million LVL (14.55 million EUR) representing a 16% increase compared with the 12 months of financial year 2008/09. The best sales results were reached in the Asia Pacific, Africa and Middle East region where 88% y-o-y growth was reached, amounting to LVL 5.9 million (EUR 8.48 million) in the 12 months of FY 2009/10 and a 33% increase was recorded in America. Sales in Europe and the CIS region were substantially (by 43%) lower than in the previous financial year. This was mostly impacted by very low sales in the CIS. The recent customer survey lists product price, quality and customer support as the key features for choosing SAF Tehnika as the partner. The net profit of the Company for the fourth quarter of financial year 2009/10 was 1.23 million LVL (1.76 million EUR). The net profit of the Company for the 12 month period of the financial year 2009/10 was 1.47 million LVL (2.1 million EUR) which is by 2.71 million LVL (3.86 million EUR) better than the result for the 12 months of the financial year 2008/09. This is a great result and proves that the Company's strategy towards development of a new CFIP product line, expansion of direct sales, investments into product marketing, cost savings on production and operations was right and has provided SAF Tehnika a more stable position with positive perspectives. The invaluable work and loyalty of the Company's employees also has to be mentioned as a key to success. The main targets for the company in the coming years are to achieve steady growth, maintaining high production quality and customer satisfaction levels. As uncertainty in the global telecommunication market continues the Board of the Company cannot provide certain prognosis towards sales figures despite outstanding results of the reporting financial year. 03.11.2010 - Non-audited financial results of FY 2010/11 for Q1. 02.02.2011 - Non-audited financial results of FY 2010/11 for Q2 and 6 months. 11.05.2011 - Non-audited financial results of FY 2010/11 for Q3 and 9 months. 10.08.2011 - Non-audited financial results of FY 2010/11 for Q4 and 12 months. Information about the decision adopted at the supervisory council meeting of JSC "SAF Tehnika" on the 21st of July can be found in the attachment. Excerpt from JSC "SAF Tehnika" shareholders' meeting, which took place on the 12th of July, can be found here. Excerpt from JSC "SAF Tehnika" shareholders' meeting, which took place on the 12th of July, can be found in the attachment. Information on the resolution adopted at the extraordinary shareholders' meeting of JSC "SAF Tehnika" can be found in the attachment. In June 2009 JSC „SAF Tehnika" started a research project "Development of solutions for design of new-generation wireless digital microwave radio products" co-financed by European Regional Development Fund and Latvian national budget according to the concluded agreement No.L-JPI-09-0002 (project No.JPI/2.1.2.2.1/08/01/0002) with the state agency "Investment and Development Agency of Latvia". The project is being implemented according to the project plan and the second interim report has been submitted. 1) The research on designing the algorithm for pre-distortion coefficients and the results will be applied in the concept of new SAF products; 2) Technical pre-research of duplexer- within a scope of this activity wide range of research work had been done - information analysis, programming, designing of technical solutions as well as evaluating the alternatives. New research activity has been started - modeling of a duplexer and soon testing of the evaluation of allowable errors of duplexer parameters will be started on the base of a real project. Using real duplexer models, it is planned to estimate the efficiency of the acquired solutions, as well as define suitability areas of the algorithm. Attachment contains the draft resolution of the extraordinary shareholder's meeting of JSC "SAF Tehnika" and information on potential candidates to the office of a member of the Supervisory Council. Information on JSC "SAF Tehnika" extraordinary shareholders' meeting can be found in the attachment. According to the agreement No.L-ĀTA-09-0119 (project No.ĀTA/2.3.1.1.1/09/04/013) concluded on 13th August 2009 between JSC "SAF Tehnika" and government institution "The Investment and Development Agency of Latvia" regarding the implementation of a project "Participation of JSC "SAF Tehnika" in international exhibitions in the Republic of South Africa, Germany and Russia", SAF exhibited at SviazExpoComm2010 which took place in Moscow, Russia, from 11th to 14th May. During the exhibition SAF employees were meeting the stand visitors and telling about SAF products and the Company, as well as answering technical questions of those visitors who already came with a specific project and were looking for the best solution. In total, approximately 100 visitors were attending SAF booth including the existing customers and at least 30% new qualitative leads. SAF booth has always attracted attention at SviazExpo Comm exhibition with its design and quality, however this year the booth was particularly attractive as well as the comparatively small space and the open layout were put into effect. This year SAF Tehnika advantage of having R&D and manufacturing in one place was specifically highlighted with the help of the logo - Produced in Europe, thus providing the quality that cannot be achieved by having manufacturing at a totally different production unit that is not related to the Company and where the equipment quality cannot be tested, for example, in China. Before the exhibition several meetings were organized with the partners who had been invited to SAF stand to discuss further cooperation and how to increase the sales of SAF products. By exhibiting at SviazExpoComm2010 the customers ascertained that SAF is known and valued member of the industry. During the exhibition SAF employees acquired new perspective contacts for future cooperation. 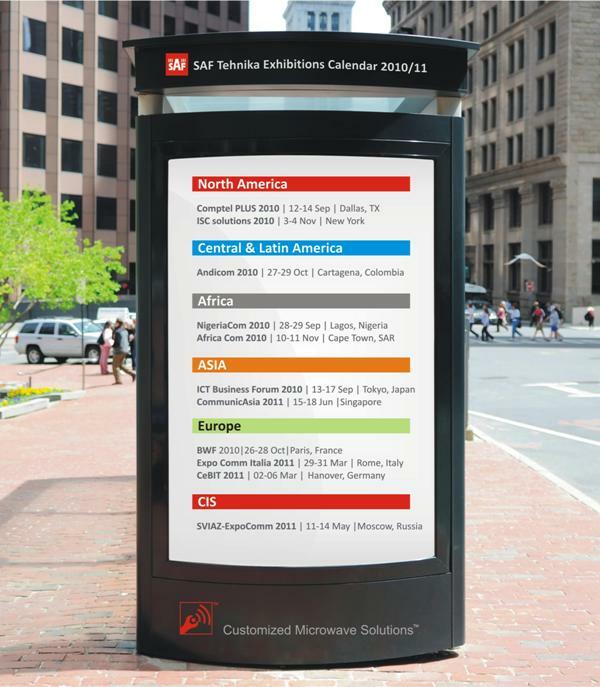 During the exhibition all SAF product lines were presented in SAF booth # 81C50. The visitors showed the most interest in the latest SAF products - CFIP Lumina FODU and CFIP PhoeniX Split Mount system. The Company's non-audited net sales for the third quarter of financial year 2009/10 were 2.77 million LVL (3.9 million EUR) representing a 27% increase compared with the third quarter of the previous financial year and reaching the highest quarterly sales result during the last 7 quarters. SAF Tehnika's products were sold in 54 countries during the reporting quarter. The Company has earned customers' confidence and ever larger project supplies have been awarded to SAF Tehnika. Sales in Asia Pacific, Middle East and Africa represented the largest part of 3rd quarter's turnover (66%). Sales rose there by 68% or 0.74 million LVL (1.05 million EUR) compared with the same quarter of the previous corresponding period. The Company's non-audited net sales for the 9 months of financial year 2009/10 were 6.48 million LVL (9.23 million EUR) representing 95% of the 9 months of financial year 2008/09. Sales results due to extensive sales force endeavours in all regions promoting SAF Tehnika's products, an increase in demand for CFIP products, cost savings in the production process and operations resulted in an outstanding net result in the third quarter and for 9 months of 2009/10 financial year. The net profit of the Company for the third quarter of financial year 2009/10 was 607 thousand LVL (864 thousand EUR). The net profit of the Company for the 9 months of financial year 2009/10 was 242 thousand LVL (345 thousand EUR) which is by 1.22 million LVL (1. 74 million EUR) better than the result for the 9 months of financial year 2008/09. SAF Tehnika target is to close 2009/10 financial year with a positive net result. JSC "SAF Tehnika" do confirm that the information given by member of the board, CFO Aira Loite, in the interview given to LETA and published on April 22 is true and the company will experience growth of turnover in FY 2009/2010 and plan to work without losses. The project is being implemented according to the project plan. The research on designing the algorithm for pre-distortion coefficients evaluation is continuing and the results will be applied in the concept of new SAF products. The work on technical pre-research of duplexer is also continuing. Within a scope of this activity wide range of research work is being done - information analysis, programming, designing of technical solutions as well as evaluating the alternatives. According to the agreement No.L-ĀTA-09-0119 (project No. ĀTA/2.3.1.1.1/09/04/013) concluded on 13th August 2009 between JSC "SAF Tehnika" and government institution "The Investment and Development Agency of Latvia" regarding the implementation of a project "Participation of JSC "SAF Tehnika" in international exhibitions in the Republic of South Africa, Germany and Russia", SAF exhibited at CeBIT 2010 which took place in Hannover, Germany, from 2nd to 6th of March. During the exhibition the SAF employees were meeting the partners who had been invited to SAF stand for discussing further cooperation as well as meeting new partners and end users. By exhibiting at CeBIT 2010 the customers ascertained of SAF Tehnika as a known and valued representative of microwave equipment industry. And new perspective contacts were acquired for future cooperation. During the exhibition all SAF product lines were presented in SAF booth # B73. The visitors showed the most interest about the latest SAF products - CFIP Lumina FODU and CFIP PhoeniX Split Mount system. According to the agreement No.L-ĀTA-09-0119 (project No. ĀTA/2.3.1.1.1/09/04/013) concluded on 13th August 2009 between JSC "SAF Tehnika" and government institution "The Investment and Development Agency of Latvia" regarding the implementation of a project "Participation of JSC "SAF Tehnika" in international exhibitions in the Republic of South Africa, Germany and Russia", SAF Tehnika will exhibit at Sviaz ExpoComm 2010 which will take place in Moscow, Russia, from 11th to 14th of May. We kindly invite You to visit SAF booth # 81C50, hall 8-1 and learn about SAF latest products - CFIP Lumina All Outdoor 366Mbps system and CFIP Phoenix Hybrid Split Mount 366Mbps system. According to the powers conferred upon the Supervisory Council of JSC "SAF Tehnika" at the annual shareholder's meeting on 12th November 2010, Supervisory Council of JSC "SAF Tehnika" has approved SIA "Potapoviča un Andersone" as the auditor of its annual report from FY 2009/2010. According to the agreement No.L-ĀTA-09-0119 (project No. ĀTA/2.3.1.1.1/09/04/013) concluded on 13th August 2009 between JSC "SAF Tehnika" and government institution "The Investment and Development Agency of Latvia" regarding the implementation of a project "Participation of JSC "SAF Tehnika" in international exhibitions in the Republic of South Africa, Germany and Russia", SAF Tehnika will exhibit at CeBIT 2010 which will take place in Cape Town, South Africa, from 2nd to 6th of March. We kindly invite you to visit SAF booth #B73, hall 12 and learn about SAF latest products - CFIP Lumina All Outdoor 366Mbps system and CFIP Phoenix Hybrid Split Mount 366Mbps system. JSC "SAF Tehnika" non-audited net sales for the second quarter of financial year 2009/10 were 2 066 500 LVL (2 940 365 EUR), representing 90% of the second quarter of the previous financial year. Sales in Africa represented the largest part of 2nd quarter's turnover (47%). Sales there rose by 78% or 0.43 million LVL (0.61 million EUR) compared with the same quarter of last financial year. The first turn-key projects were successfully completed in this region. The largest negative revenue impact was from sales in the CIS - a decrease of 98% or by 0,75 million LVL (1,07 million EUR). This region could become more active in the spring of 2010. The Company's non-audited net sales for the 6 months of financial year 2009/10 were 3716 966 LVL (5 288 766 EUR) representing a year-on-year revenue decrease of 20%. The net loss of the Company for the second quarter of financial year 2009/10 was 181 388 LVL (258 090 EUR). The net loss of the Company for the 6 months of financial year 2009/10 was 365 022 LVL (519 380 EUR). The net loss mainly reflects lower sales and falling margins due to increasing competition and a lack of funding for investments for SAF Tehnika's clients. Even taking into account the existing results, the company continues to be financially stable. The management is shifting the company's strategy towards delivering more specialized niche products and looking for cooperation partners and new collaboration forms with vendors who could supplement the current offering to the company's clients. The focus is the full introduction of an extensive CFIP product line and development of customer tailored solutions. The main goal is to make the company's business profitable again. On 7th January 2010 JSC "SAF Tehnika" received information that private person Gatis Poiss has alienated all of its 327 839 JSC "SAF Tehnika" capital shares. These shares, which amount to 11.04% (not 11.4% as was declared previously) of share capital of JSC "SAF Tehnika", were acquired by a limited liability company "Maleks S". JSC "SAF Tehnika" informs that on 7th January 2010 it has received information that a private person - Inga Ozolina has acquired a significant amount of JSC "SAF Tehnika" share capital, indirectly acquiring rights to vote stemming from the shares. These rights to vote Inga Ozolina has acquired through a company "Maleks S" SIA which holds 327 839 shares or 11.04% of JSC "SAF Tehnika" share capital. On 7th January 2010 JSC "SAF Tehnika" received information that private person Gatis Poiss has alienated all of its 327 839 JSC "SAF Tehnika" capital shares. These shares, which amount to 11.4% of share capital of JSC "SAF Tehnika", were acquired by a limited liability company "Maleks S".